My wee family has been through the ringer over the past fortnight, with various health issues plaguing us. Colds and vomiting bugs have run through most of the family and I was starting to despair about us ever being healthy again. Despite loading up on vitamin C tablets and even eating raw garlic several times, my cold lingered, and all my kids came down with vomiting bugs. In desperation, I turned to my homeschool mum friends to find out their tried and true sickness remedies. 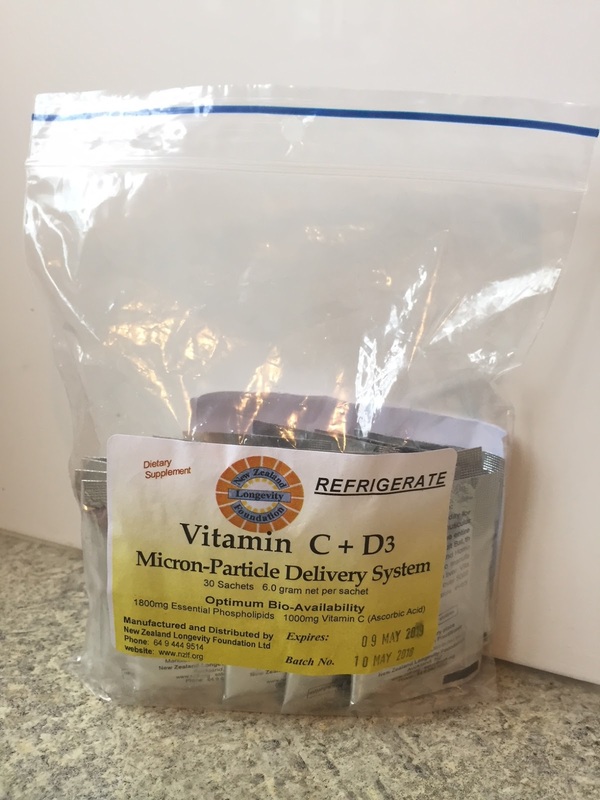 The first mum I spoke to recommended Vitamin C + D3 in a Micron-Particle Delivery System. I found this in the refrigerated section of Out West Organics in Glen Eden. It comes in gel form, in individual sachets. I've discovered it's best to tip the gel into a glass of water, where it will clump together, and drink it with my nose blocked, because it tastes disgusting and has an unpleasant consistency, like snot. I didn't see any major improvement in my cold by taking these vitamins, but I'm sure my body would have been making use of them all the same, and they possibly prevented me from getting the vomiting bug that went through the rest of the family. 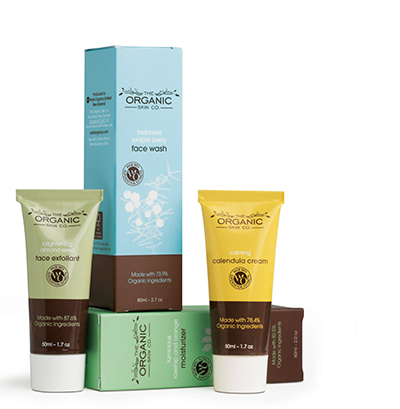 Another mum swears by Francincense Essential Oil as it is antimicrobial and anti-inflammatory. I found it at Pure Nature in Henderson and bought fractionated coconut oil to use as a carrier oil with it. 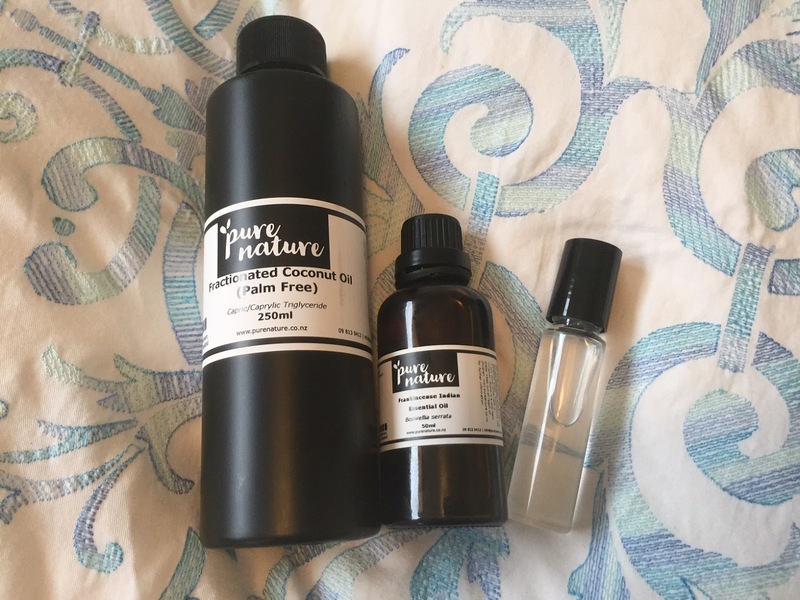 I bought the small roller ball jar to mix the two oils together for applying topically on the kids, but I have been taking one drop of the Frankincense oil under my tongue for the past three days (internal use is not recommended by Pure Nature), and noticed an immediate improvement in my sore throat and cough when I did this. It will sound strange, but I could feel the Frankincense attacking the bad cells in my throat. It was such a relief. Once my cold is completely gone, which it nearly is, I will change to taking the Frankincense oil under my tongue once a week to keep sickness at bay. The same mum also recommended iodine as an all-round health tonic, and sold me a spare bottle she had at home. In talking to her, I realised I am severely deficient in iodine. I show most of the symptoms of iodine deficiency, especially the multi-nodular goitres I have on my thyroid. It's crazy that I've seen several doctors and throat surgeons over the past two years about my thyroid, and none of them have ever mentioned iodine deficiency could be a cause. Our medical system is so clueless about nutrition, it's really quite worrying. I've also been giving a drop of iodine to the kids in milk (you can't see or taste it in when it's in the milk), to flush out any toxins from their system. I gave Paul three drops in milk yesterday, the same day L came down with her vomiting bug, and I think it was just in time because today he got diarrhoea, which I'm picking was the vomiting bug flushing out of his system without him actually having to vomit. It's easy for us in New Zealand to be deficient in iodine, because it's not in the soil here, and every time we drink water containing fluoride and/or chlorine, the iodine we do have in our system gets flushed out. For many years I've used a Brita water filter, which filters the chlorine out of our water, but doesn't filter out the fluoride. Knowing that I'm iodine deficient, I've decided to upgrade to a Fill2Pure jug, which also filters out fluoride. 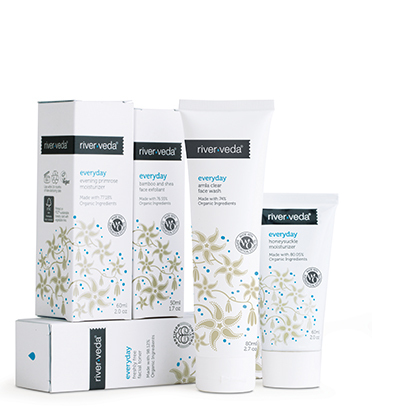 For flushing out vomiting bugs, another mum recommended activated charcoal. I bought a bottle of Red Seal Activated Charcoal from my local pharmacy today and gave one to Paul when he had diarrhoea and one to L after she had finished vomiting (since she wouldn't have been able to keep it down when she was vomiting). 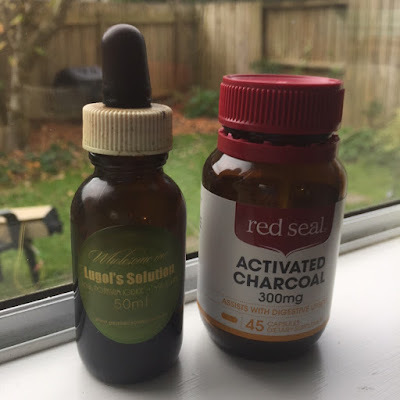 You can't take activated charcoal and iodine together, because the activated charcoal will absorb the iodine, but according to my mum friends, taking either the iodine or the activated charcoal would be good to prevent catching gastric bugs. From now on, I plan to always keep activated charcoal, iodine and frankincense in my house. I will also continue to give vitamin C tablets to the kids too, since our bodies can't make vitamin C on their own. I'm not sure if I'll get the Vitamin C and D3 Micron-Particle gel again, as it's very expensive and pretty disgusting to take. I can't imagine the kids would ever take it willingly. I'll keep using what I already bought though, as needed, until it runs out. 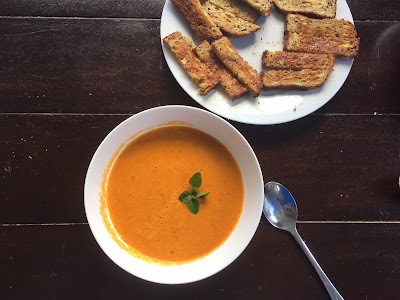 To help us recover from all our various ailments, yesterday I made us a small batch of Revive Cafe tomato soup (using homegrown tomatoes I had frozen during the summer) and a huge batch of pumpkin soup. Both soups used homemade chicken stock as their base, as it has good gut-healing properties. I froze the leftovers in several portions, to pull out for easy dinners on busy sports' nights. 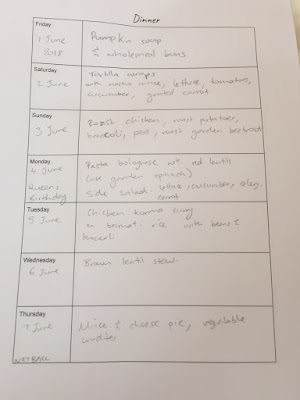 While I was at my friend's house yesterday, picking up the iodine I had bought from her, she showed me how she plans her weekly dinner menus. 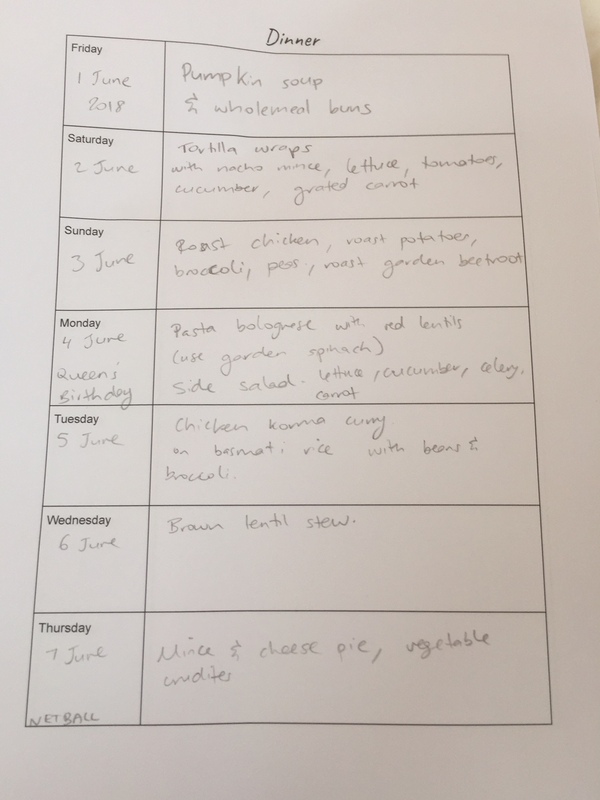 I was so inspired by her system, I went home and typed up a similar document and planned out this week's menu. My menus run from Friday to Thursday, because I do my grocery shopping on a Thursday. 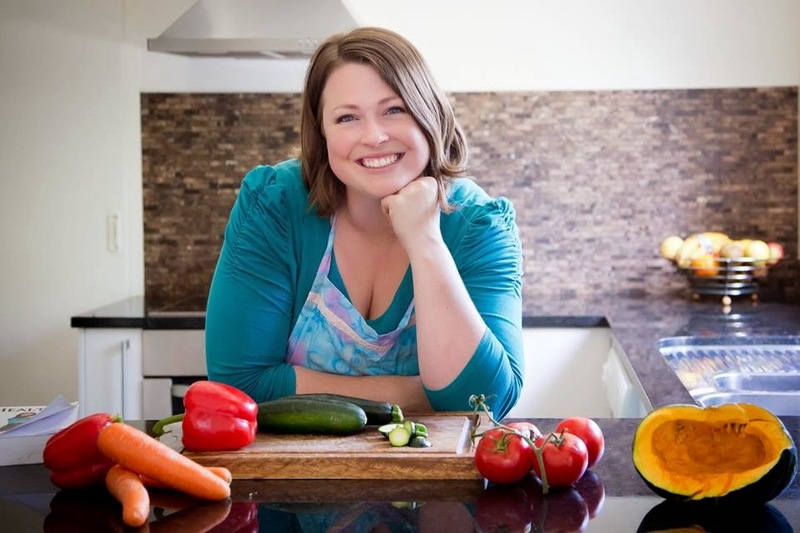 For my menu, I tried to think of vegetables I have growing in the garden, as well as other items I want to use up from the fridge, freezer and pantry. This same friend also lent me her DVDs of The Truth About Cancer documentary, which is where she learned a lot of beneficial health information. 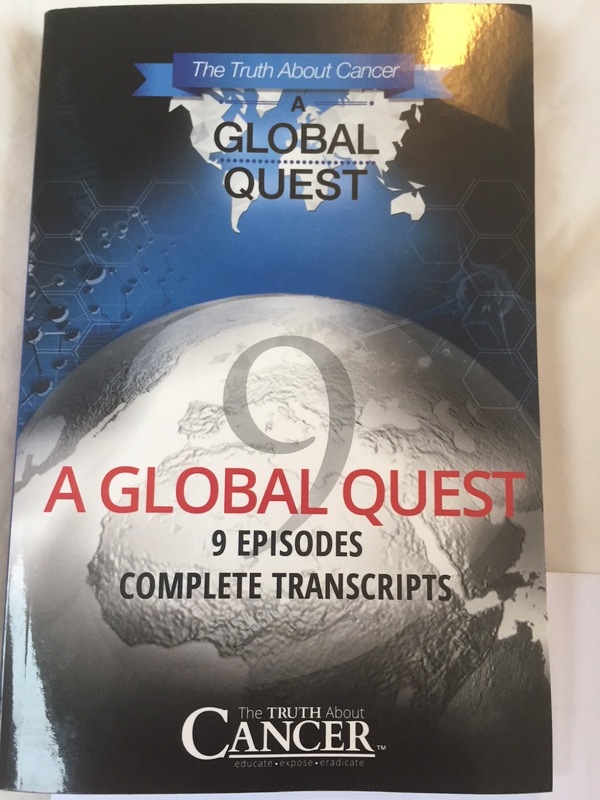 I couldn't get the DVDs to work properly in my laptop, but fortunately she had also lent me the complete transcript of the documentary, so I've been reading it instead. Very enlightening! It has given me hope for my health again, where before I had been feeling like I was on a downward spiral. With rain forecast for today and the next few days, I spent this morning cleaning our car, cleaning toilets, washing all our cushion covers, washing L's bedding, washing the dining room chair covers, mopping downstairs with Dettol and wiping all the lounge furniture with Dettol. I still need to tackle the upstairs bathroom with Dettol, to really feel like I've killed whatever vomiting bug germs are lingering in the house, but hopefully with everything clean at home and with all the healthy supplements we're taking, we will start to be a family of health again. I always put the frankincense oil in a tsp of manuka honey and hold and let dissolve in my mouth pure essential oil can burn the tender membranes in our mouth and throat if not careful and besides the honey helps the throat as well plus tastes yummy. Thanks Debra, I'll try taking it in honey. Yes I agree. Don't take essential oils straight. Have a drop in a glass of water if you must take orally. Put in a roller with oil and rub on your feet. OnGuard from DoTerra is amazing for colds, etc. I make drinks with garlic (3 or more cloves crushed), root ginger, sprig thyme in boiling water, add lemon and honey. Very pleasant to drink and great to chase the bugs away. Weleda have a throat spray - use at first signs of a sore throat and knock it dead before it gets hold. I find it is wonderful. I find those Vit C excellent too but just use when youa re sick. Use another good Vit C inbetween. Thanks Margo! I have thyme growing in the garden, so I'm going to try your drink concoction.